This thing looked absolutely gorgeous on the packaging, but of course that's only a 'serving suggestion'. The things that make it look great are the colourful items like lettuce, artfully placed tomato and so on. Sadly, you have to provide your own. Whenever I do a taste test, I don't pimp things up in any way - I want to see and taste what I bought, prepared as instructed by the manufacturer. Which is a shame, because I know this thing would be at its absolute best if I fried it. But the maker won't tell you to do that because they want you to think it's healthy. And, of course, it would be massively improved, nutritionally and visually, by adding some crispy lettuce, juicy tomato and maybe some diced onion. This thing sells for £2.10 (although I got mine in an offer for £1.05), and what you get for that is a sesame bread bun, a breaded chicken burger, and a sachet of 'special' mayonnaise. I think the mayo is 'special' because it has a hint of lemon in it. I followed the cooking instructions to the letter - microwaved the burger (no oil added), toasted the bun (no butter added). Put it together with the 'special' mayo and ate it. It was pretty grim. Dry, flavourless, absolutely screaming out for some lubrication. I gave it an over-generous 5 out of 10 in the video. I don't know why. Even at half-price this thing is massively overpriced. For the full price, you could buy well over half of a real chicken. The video above is from the Keef Cooks YouTube channel. 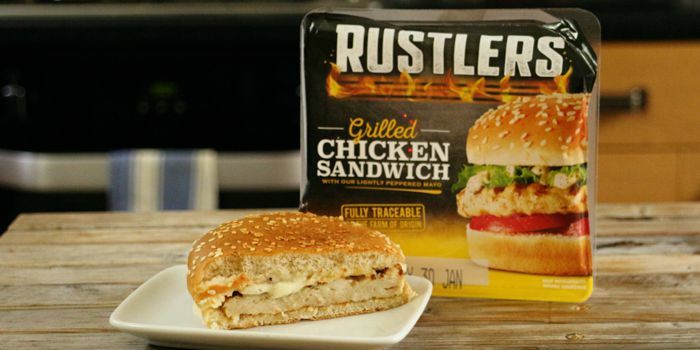 Click here to see the video recipe of Rustler\'s Chicken Burger - Taste Test and Review on YouTube.